Description: A UP train pulls out of siding at Riverside/Pevely on the De Soto Sub behind a pair of GP40-2s split by an SW1500. 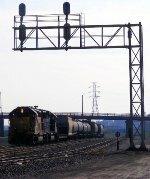 Description: This local was at an ex Mopac yard near Cape Girardeau. It looked like the kind of place that gets flooded out periodically, very close to the river. Description: Will it be a "good year" for UP? Description: Union Pacific #1475, 1532, & 1501 are making a northward light power move across Rock Creek in historic Kimmswick, MO as they head north to Wicks Crossing to pick up a cut of cars to take southward to DeSoto, MO on a beautiful mid June evening. The light was perfect for photos!! Title: UP 1475 waits for its next duty. Description: These units were all sleeping at this time, while a couple of LLPX units were working further down the line. Description: UP 1475 leads the local west on the UP Jeff City Sub. as it heads through Dozier on its way to the US Silica Plant in Pacific, Mo. Description: UP 1475 leads the local west on the UP Jeff City Sub. 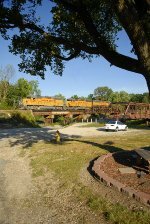 as it heads through Dozier on its way to the US Silica Plant in Pacific, Mo. and even has some empty lumber cars trailing on this run. Description: UP local brings NW 2156 from Museum of Transport to exchange with NS. Description: Two units from the local were added to the special, to get it up the hill from MoT, in the pouring rain. Description: UP 1475 and GMTX 2100 roll through the Dozier Crossovers as light power, currently heading towards the U.S. Silica Plant in Pacific, Mo. along the UP Jeff City Sub. Description: UP 1475 leads the local west on the UP Jeff City Sub. as it heads through Dozier on its way to the US Silica Plant in Pacific, Mo. and also has some extra baggage than the usual consist of only 2 bay sand cars.